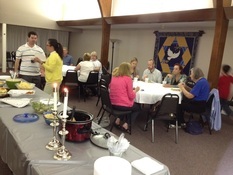 Join us on the first Friday evening of every month for a potluck Shabbat dinner at the NJC. Our next dinner is August 3rd, beginning at 6:30 p.m. Our potluck dinners combine aspects of a traditional Shabbat dinner with good food, fun and a feeling of community. We'll light the Shabbat candles and do kiddish and motzi. We observe "kosher style," meaning that because our dinners include meat dishes, we ask that the dishes you bring not include cheese or other milk products. Learn more about Shabbat here. Learn the Shabbat evening blessings here.